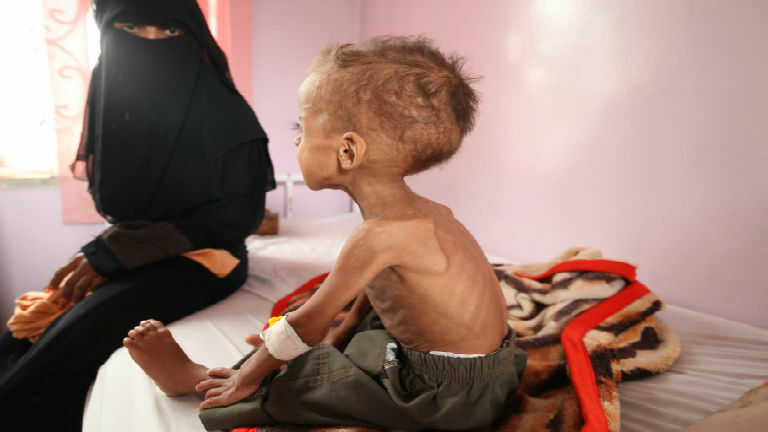 Yemen is one of the most terrifying places in the world to be a child. Children are bearing the brunt of a brutal armed conflict which escalated in March and shows no sign of a resolution. Scores of children are dying every month, while those who survive live in constant fear of being killed. Since the escalation of fighting, basic services have been decimated. Food, medicine and water are all in short supply. Nearly 10 million children – 80 per cent of the country’s under-18 population – need urgent humanitarian assistance. More than 1.3 million people have been forced to flee their homes. Children killed by bullets and bombs can be counted, but countless more risk death from malnutrition or otherwise preventable diseases as essential social services fail. First the children went by bus to their uncle’s house, in Mokha, but they didn’t feel safe as the house was near a military camp. And so they took the boat and started a two-day journey to Djibouti. Before she fled, Nada’s 4-year old friend, Abdul Rahman was killed by a sniper. “I do not want to die like him”, she says. Despite these tremendous needs, our response is grossly underfunded. Only 16% of the funding appeal has been raised so far, making it one of the most under-funded emergencies in the world. What is Zika and how is UNICEF responding?